Australian domestic fares have tumbled in the past year as Tiger claws its way back into the market from its grounding in 2011, and Qantas and Virgin Australia continue to slug it out for overall market share. It is unlikely that the pressure on fares and thus yields will let up in 2013 as Tiger continues to add capacity and Virgin and Qantas, along with Jetstar, stick to their targets to add between 7% and 9% capacity in the first half of the current financial year. All those extra seats should keep a lid on any fare rises, and if Virgin is given the regulatory green light to take effective control of Tiger Australia, along with the promised investment to expand the LCC, there is a real prospect that fares will reduce even further. Virgin’s concerted and ultimately successful effort to gain a 20% share of the domestic corporate market, together with Qantas' defence response to maintain its 65% line-in the-sand overall domestic market share, has resulted in capacity flooding the market which, compounded by weakening economic conditions, looks sure to continue to drive fares down. Seat capacity across the Australian domestic network increased 14.2% during the course of 2012, to end the year on 1,516,135 seats, having peaked at 1,554,936 in Sep-2012, according to Innovata. The combined role of Qantas Group's dual brand strategy is clearly evident in the graph below, as Qantas prepares to reduce seat numbers (year on year) over the next six months, while Jetstar grows. Far from being a "conspiracy" to run down the main brand, this appears to be a recognition of the changing profile of the domestic market, as the leisure-priced fares drive consumer spending habits. Capacity on the Sydney-Melbourne route, Australia’s biggest, peaked in Sep-2012 at 109,299 seats a week, up from 85,697 seats a year earlier, much of it due to LCCs Jetstar and Tiger substantially increasing their respective capacity during the year. Jetstar capacity on the route peaked at 17,387 one-way seats in the first week of Oct-2012, up 85.5% on the start of the year. Tiger grew capacity by 5,760 seats over the first half of the year, or 71.1%, to 13,860 seats in July. Tiger will ramp up to a new level from 01-April-2013 when it will move to 18,900 seats, overtaking Jetstar and taking the total seats available to 112,232 in Apr-2013, according to Innovata data. Qantas increased capacity in Jul-2012 by about 7,400 seats a week to maintain a capacity share of about 45% on the route, according to Innovata. But this is scheduled to reduce to 41% in Apr-2012 as additional seats from Tiger take its capacity share to 16.8%, in the process overtaking Qantas’ LCC subsidiary Jetstar on 14.7%. Virgin, which added about 6,000 seats a week to the route early in 2012 and maintained about 30,500 seats a week for much of the year, will have its capacity share ease a little to 27.6% in Apr-2013. Tiger will more than double its seats on the Sydney-Brisbane route in Apr-2013 taking its capacity share to 15.4%, almost double Jetstar’s 8%, and total capacity on the route to 63,020. Total capacity between Sydney and Brisbane was boosted when Tiger resumed services on the route in Aug-2012. 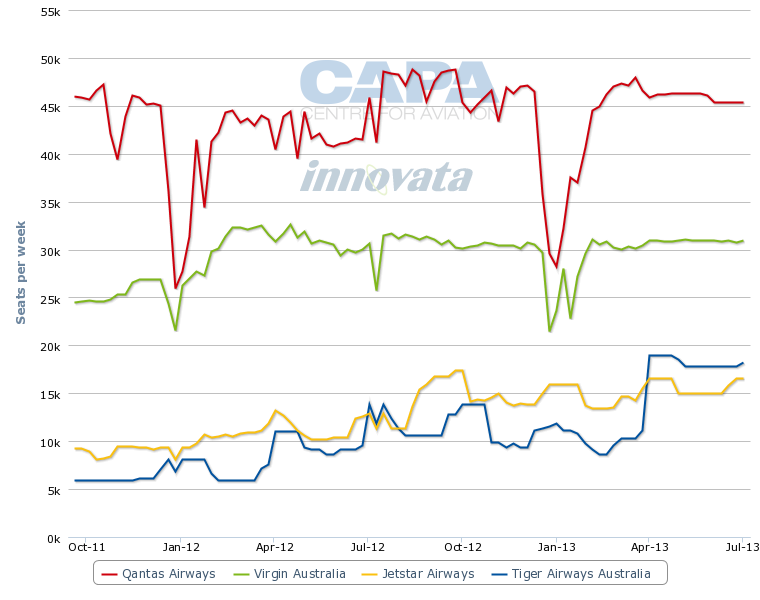 Tiger’s expansion has also resulted in Virgin Australia and Qantas losing capacity share on the route since end Jul-2012. 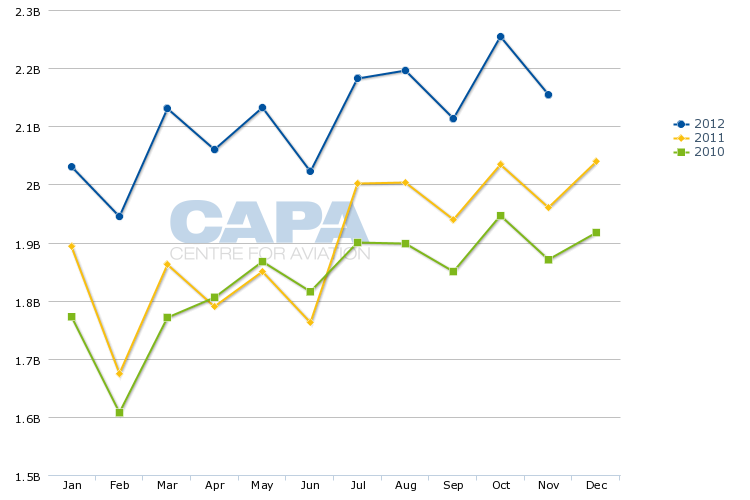 Qantas will see its capacity share between Sydney and Brisbane slide from a dominant 51.1% in Jul-2012 to 42.6% in Jul-2013. Over the same period Virgin’s position will reduce from 39.8% to about 34% by Jul-2013. Virgin Australia CEO John Borghetti said in Nov-2012 that he was confident Virgin’s proposed 60% acquisition of Tiger Australia will allow it to challenge Jetstar in the leisure market in the same way Virgin had challenged the LCC’s parent Qantas in the business market where it has won a 20% share of the corporate and government market. Tiger Australia accounts for just under 5% of Australian capacity, according to Innovata. But that capacity is concentrated on only a few routes where its impact is more significant than that bare statistic suggests. And if aggressive growth plans are implemented under joint Virgin Australia and Tiger Airways ownership, its market share could increase to 15%, bolstering Virgin’s overall market share. The joint venture (which has Virgin Australia owning 60% of Tiger Australia) plans to triple Tiger Australia’s fleet of A320s to 35 over the next five years, creating a potent weapon with which to tackle the Qantas-Jetstar combination. But there are more issues at stake. Australian Competition and Consumer Commission (ACCC) chairman Rod Sims is concerned the AUD35 million (USD36.6 million) proposed merger will remove the third player in the aviation market. Competition legislation is complex and outcomes are predictably unpredictable, often seemingly conflicting with wider, more "logical" strategy considerations. Having a third player in a market typically makes for vastly greater competition than is the case with a duopoly. 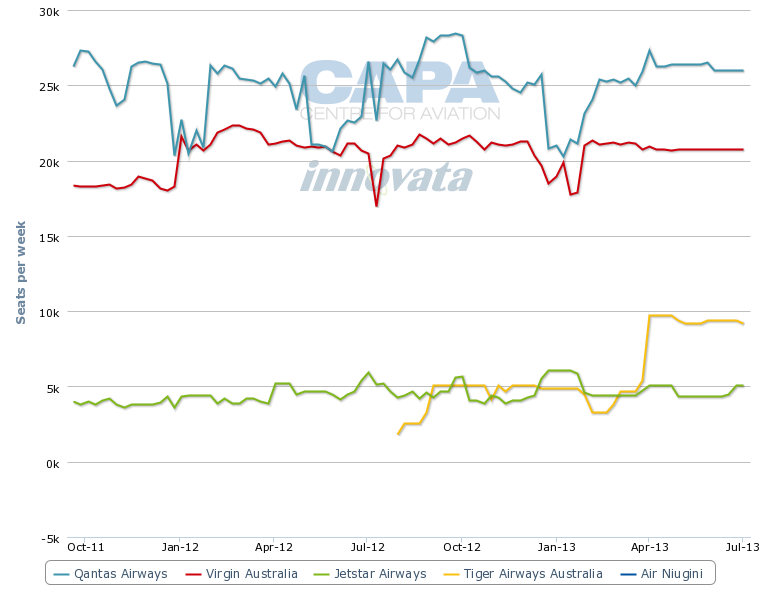 However, where the would-be two main players in the market (Qantas-Jetstar and Virgin-Tiger) are actually four airlines, each with a much more complex interactive competitive impact than has been the case in markets in the past, the issue of losing the "third" competitor becomes much less obvious. Although there may be some parallels in other industries - although similar examples are hard to find - the simple fact is that there is no precedent in the aviation business for such a strategic divide. Since its relaunch in Aug-2011 following a six week grounding by regulators on safety for safety reasons, Tiger Australia has set about steadily rebuilding its network. Meanwhile, in its absence, Jetstar took the opportunity to expand rapidly. For the 12 months to Dec-2012, Tiger Australia recorded an 11% increase in traffic to 2.2 billion RPK, following a 14% increase in capacity to 3.0 billion ASK. Consequently, passenger load factor was 82%, down 2% from the earlier period. The number of passengers carried grew 6% year-on-year to 2.1 million passengers. Tiger’s re-entry to the market initially drove fares back down with the Australia Bureau of Infrastructure, Transport and Regional Economics (BITRE) domestic air fare index falling from a peak of 92.8 in Dec-2011 to 54.8 in Apr-2012. Since then, however, the index has trended up and spiked to a new four year high of 95.5 in Dec-2012, 2.9% above the Dec-2011 mark. The BITRE figures of course cover the entire Australian market, so can disguise changes on specific routes, but the trend was obvious. What will happen in the next six months is less obvious though. Tiger for example is offering a wide array of "twofers" in May/Jun-2013, suggesting considerable softness in forward bookings for that period - and will inevitably push down average fares in that period. Full economy and restricted economy fares were also higher in Dec-2012 when compared to Dec-2011, up 30.9% and 7.3% respectively. The battle between Qantas and Virgin Australia for corporate customers, however, saw the business class index fall 29% year-on-year to another record low. Business class fares on some routes have fallen by up to 40% as Virgin upped the pressure on Qantas and capacity increased. Tiger’s lowest one-way fare advertised on its website for 15-Feb-2013 is AUD64.95 (USD68.48), more than AUD20 (USD21.09) cheaper than Jetstar’s AUD85 (USD89.62) offering. Tiger’s cheapest one-way lead-in fare on the route is typically AUD45 (USD47.45) while Jetstar starts at AUD65 (USD68.53). However, Tiger’s pricing still falls well short of the AUD25 (USD26.35), it frequently charged for lead-in fares before its grounding. That level of pricing appears to have proved unsustainable. Travellers on the trans-continental Melbourne-Perth and Sydney-Perth routes have been particular beneficiaries of lower business fares as both airlines deployed widebody Airbus A330s with improved inflight products. Business class fares range from AUD1,572 (USD1,657.43) one way on Qantas to AUD999 (USD1,053) on Virgin booked a week in advance. Virgin also undercuts Qantas on publicly available economy fares, charging AUD219 (USD230.93) one way compared to AUD249 (USD262.56) on Qantas. Intensifying the battle, Qantas announced in Nov-2012 that it will deploy widebody A330 aircraft on all weekday Sydney-Perth and Melbourne-Perth services from May-2013 to cater to the demand for business and premium travel on the routes. Qantas has 30 widebody aircraft operating on domestic routes in Australia, made up of A330 and Boeing 767 aircraft. Passenger numbers between Melbourne and Perth grew by 27.8% year on year in Oct-2012 according to Australia BITRE, while numbers between Perth and Sydney increased by 9.5% to 163,817. 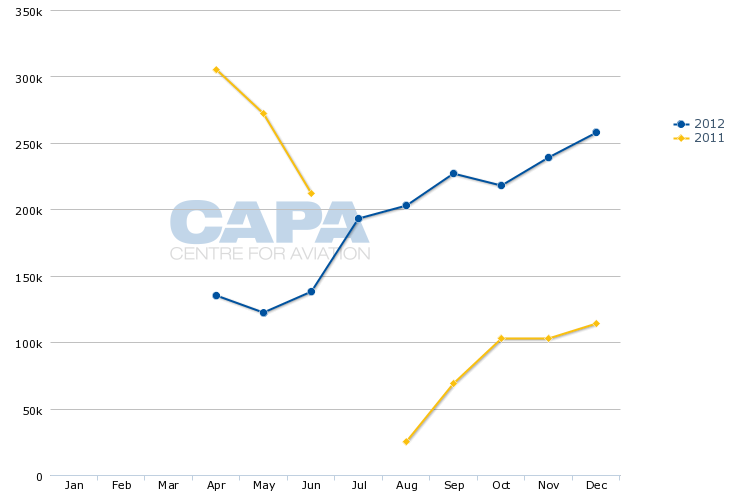 Virgin Australia has increased its capacity share on the Melbourne-Perth route from about 20% in Oct-2011 to 32.7% currently. 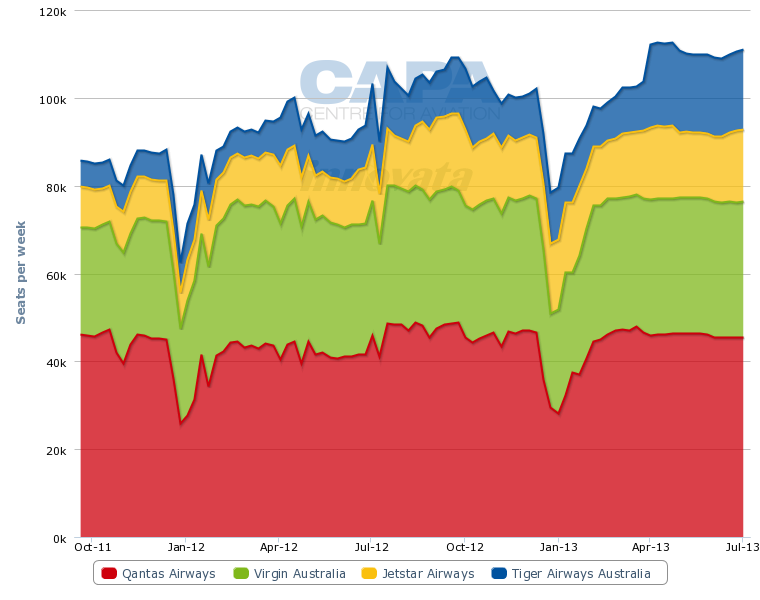 Over the same period Qantas has seen its capacity drop from about 60% to 44.1%. Virgin Australia had a target to grow domestic capacity by between 8% and 9% in 1H2013 and has predicted an improved profit before tax for FY2013. However, Virgin’s capacity increase targets are running well ahead of demand. In the financial year to Nov-2012 ASKs increased 9.6% on RPK increases of 4.5%, resulting in load factors falling 4% to 78.1%. Qantas expects to increase total domestic capacity, including Jetstar, by between 7% and 9% in 1HFY2013. The capacity increase is also expected to drag down group yields for the half year. Qantas Domestic is not achieving desired yield levels, and is aiming to “protect and improve the customer offering” while simultaneously attempting to lower the cost of service Qantas Domestic, CEO Lyell Strambi was reported as saying in Dec-2012. The Virgin move to take on Qantas as a full-service airline, a softening economy and the oversupply of capacity will have put pressure on domestic earnings. An early indication of the extent of the financial damage from the capacity battle will be revealed in Feb-2012 when both carriers present their 1HY2013 financial results. But each will be anticipating some setbacks along the way, as the calibrations of the Australian domestic market competitive environment are reset. This fundamental shift in market dynamics makes it all the more important that the ACCC makes the right decision on the Virgin-Tiger deal, whichever way it goes; getting it wrong has the potential to upset outcomes at one of the more sensitive periods in the always intriguing Australian domestic marketplace.